49ers running back Frank Gore entered Sunday’s game against the New York Giants dealing with an ankle injury that limited all week in practice. Although Gore did play on Sunday, he was fairly limited (six carries) and left for extended stretches of the second half. At one point, NFL on FOX reporter Pam Oliver said Gore was questionable to return with ankle and knee issues, but Gore did return for small segments of the second half. 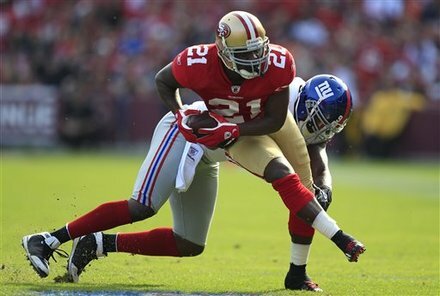 Following the game, 49ers head coach Jim Harbaugh declared that Frank Gore would be able to play next week against the Arizona Cardinals. Frank Gore indicated in a post-game interview that his position coach Tom Rathman had been holding him back to avoid further aggravation. Be the first to comment on "Gore expects to play in Week 11 vs. Cardinals"